Why Buy Natural Sea Sponges? All of these sponges are farmed sustainably, anti-microbial and long lasting. Most of my products are farmed in the Gulf of Mexico and the Caribbean. These sponges are what our grandmothers used until the "man made petroleum-based" sponge came in to the picture in the late 1950s. The man made sponge is a bacteria ridden, smelly petroleum based poor cleaner. They are also thrown away often and fill our land fills. 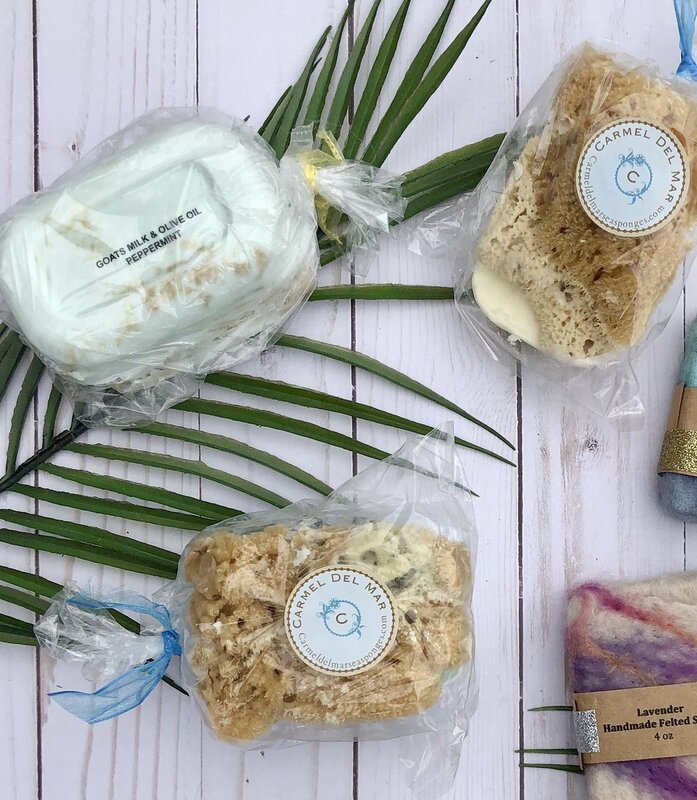 I sell my sea sponges to help change the world and embrace more natural products one sponge at a time. Fact: 90 percent of European households only use Natural Sea Sponges. All-natural and the most luxurious, gentle, and aromatic around! Our soap is infused with four distinct oils, making it very nourishing for your skin, and will not dry your skin out like other soaps. This soap has been felted with wool. A soap and washcloth all in one! The soap remains in the wool, which provides a gentle exfoliation when rubbed on the skin. The soap lathers through the wool, helping to preserve the soap. This is a very long lasting soap and can be used for over three months easily, and it looks pretty next to your sink or in your tub. African Black soap, is great for those with skin problems, from acne to eczema, rosacea and dryness! If you’re trying to cut back on the amount of toxins you put on your skin, Black soap gently cleanses impurities without the harmful chemicals. You can even use it as a shampoo or mild makeup remover. It has amazing healing attributes! The most amazing special gift for yourself and others. A yellow sponge embedded into a lovely scented, hydrating, smooth goat milk and olive oil soap. It's great for showering fun. Give it to that special someone so they remember you when they shower or bathe. Don’t forget about the miniature ones for the bathroom sink! Lovely driftwood for home decor. Soap nuts are an all-natural chemical free alternative to store bought detergents for doing your laundry. 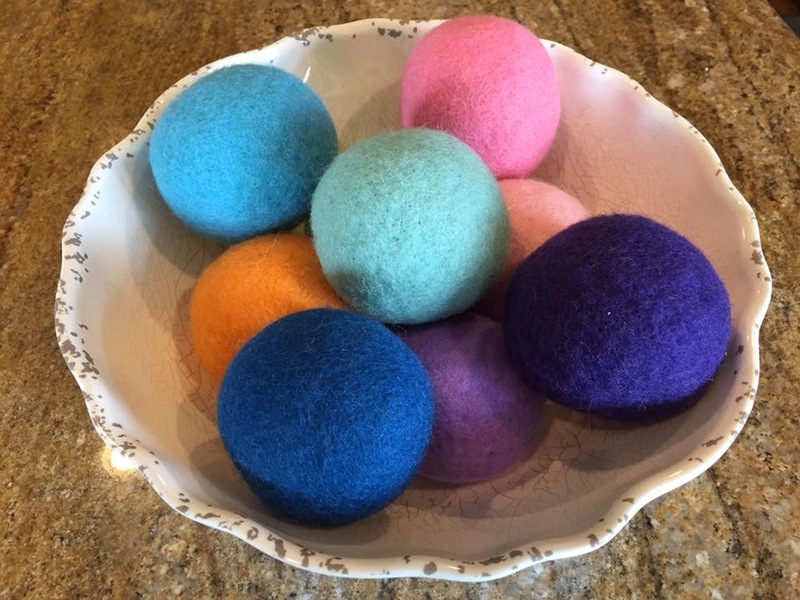 4 Pack of amazing Felted Dryer Balls! Save time, money, energy, and reduce static. Holds more water than any sponge you've ever used! With soap, the lather these sponges create is exceptionally smooth and silky. Contains natural enzymes that inhibit the growth of molds and bacteria, keeping them immaculately clean and odorless, the way God intended. Lasts much longer and cleans with much less effort than synthetic, petroleum-based sponges that smell, and clog our landfills. Natural sea sponges are harvested in environmentally friendly, sustainable ways. When farmed sustainably, the areas harvested even later show increased population of sponges! An Eco-Friendly alternative to fabric softeners and dryer sheets. Reduces dry-time and saves you money, while increasing fluffiness and decreasing static. By substituting wool dryer balls for fabric softeners and dryer sheets, you are lessening the chemicals introduced to your physical body. It replaces fabric softeners and dryer sheets. Soap Nuts are an all natural way to reduce your exposure to the harmful chemicals that are ever present in our modern age. Soap Nuts are the dried shell of the soapberry nut, and contain a substance called saponin, a 100% natural alternative to chemical laundry detergents. oap Nuts and saponin are here to help! Saponin has all the cleaning power of regular household detergents, with none of the harmful chemicals. Soap Nuts are just as effective at cleaning your clothes, last longer, and are less expensive compared to detergents. Less chemicals is always better! One of the most toxic items we have in our homes is dryer sheets and I found a solution to this problem. Carmel Del Mar Sponges and Natural Products is a company out of Colorado Springs that sells Wool Dryer balls. I have personally used the dryer balls and they are amazing. By adding 4 drops per ball of my favorite essential oil, my clothes smell fresh and are static free. Please check out the link to order. If you have any questions give Carmel a call 719-492-5254. She is also a user of Young Living essential oils.